Aluminium tread plate is practical, functional non-slip surface, decorative, durable and economical. 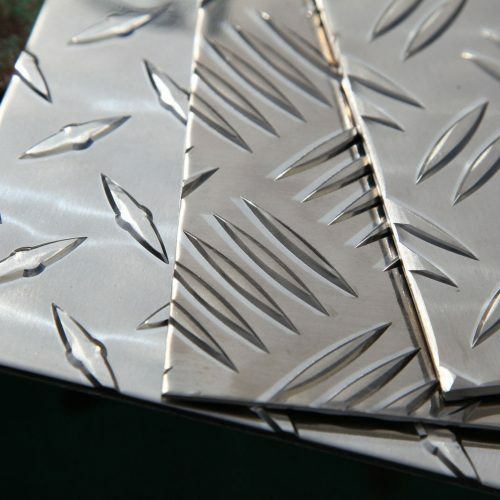 Aluminium tread plates are used as decking, stair-tread, walkways, loading bays, kick plates, flooring, vehicle accessories as well as many other decorative purposes. Aluminium Tread Plate and Sheets is a cost effective solution for non-slip and corrosion resistant applications. 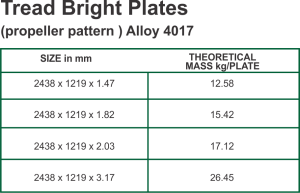 There are two different Aluminium Tread Plate patterns Tread Bright Plates (also sometimes called Propeller plate) and a 5 Bar pattern (also known as “Vastrap”). Tread Bright is finished with a propeller design head tread – a hugely popular surface that brings out the amazing shine and brightness of the product. 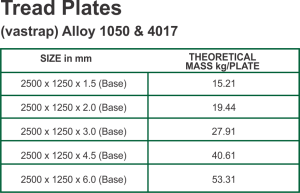 Euro Steel stocks the full range of Ali Bright in alloy 4017 whilst the 5 Bar pattern is available in alloy 1050, 4017 and 5754 on request. Other alloys and sizing are available on request. Aluminium Bright Pattern comes in a sheet size 2438 x 1219mm, whilst the standard size for the 5 bar Vas Trap pattern is 2500 x 1250mm. Aluminium Tread Bright thickness 1.143mm to 3.175mm differ to the Aluminium 5 bar pattern (Thickness 1.5mm to 6.0mm) Other alloys, sizes and thickness are available on request these may be subject to minimum orders.